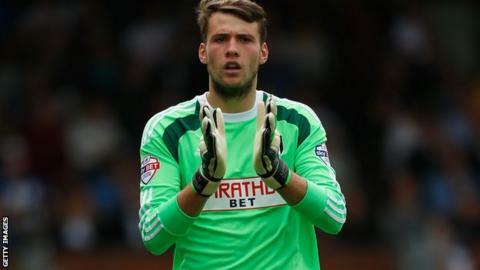 Fulham boss Kit Symons is yet to find out how long Marcus Bettinelli will be sidelined for, after the keeper suffered knee ligament damage at Hull. The 22-year-old collided with team-mate Matt Smith, who also suffered an injury to his medial ligament. "Matt's is less severe so we are probably looking at four to six weeks," Symons told BBC London 94.9. "Marcus' is more serious and he has damaged another ligament. We're just waiting on specialist advice." Bettinelli was Fulham's first-choice keeper last season and recently signed a new four-year deal at Craven Cottage. Symons believes the England Under-21 international will be out "longer term" compared to Smith, and says he could bring in another goalkeeper. "I'm delighted with Andy Lonergan but we may well be looking to strengthen in that department," he added. Meanwhile, midfielder Thomas Eisfeld has left Fulham to join German Bundesliga 2 side Vfl Bochum. The 22-year-old made nine appearances after joining from Arsenal last summer but ended the campaign on loan at Bochum.